This is one of the year’s best suspense novels, a mesmerizing, surprise-jammed mystery that works purely on its own, character-driven terms ... Mr. Hawley does a beautiful job of turning his book into an extended tease, with separate chapters about each passenger and revelations about why each could have been a target. The novel suffers a bit under the weight of [its] structure in the beginning. Too many characters are introduced in too few pages, and there’s too much repetition. But it doesn’t take long for Hawley to hit his stride ... Noah Hawley really knows how to keep a reader turning the pages, but there’s more to the novel than suspense. On one hand, Before the Fall is a complex, compulsively readable thrill ride of a novel. On the other, it is an exploration of the human condition, a meditation on the vagaries of human nature, the dark side of celebrity, the nature of art, the power of hope and the danger of an unchecked media. The combination is a potent, gritty thriller that exposes the high cost of news as entertainment and the randomness of fate. Mr. Hawley withholds the unpredictable truth about the plane crash until the final chapters, though veteran readers of thrillers may not be particularly impressed by the tricks he uses to draw out the suspense—a case of temporary amnesia that prevents Burroughs from remembering the flight and a black box that investigators take an eternity to fish out of the ocean. The real satisfaction of this addictive novel is in the face-off between Burroughs and the media mob spearheaded by Cunningham and his tabloid shock troops. On one side are the rabid forces of fearmongering, vulgarity and snide insinuation. To his surprise, Burroughs becomes a very public standard-bearer for patience and decency, and the quiet battle he wages for those virtues is cathartic. 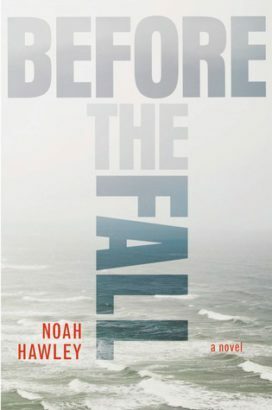 Before the Fall is about the gulf that separates perception and truth, and the people who fall into it. What did you think of Before the Fall?